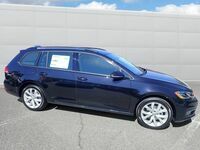 The 2018 Volkswagen Golf SportWagen has been artfully-designed to provide drivers with a practical wagon that is both stylish and sporty. A riveting 1.8-liter TSI® engine pairs with an available 4Motion® all-wheel-drive system to make the Golf SportWagen a joy on and off the blacktop. 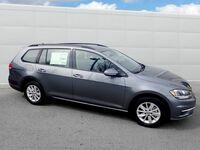 And because the new Golf SportWagen is 179.6 inches long and 70.8 inches wide, it offers drivers the passenger and cargo space of an SUV without the extra fuel costs. Take a look below as we explore the ins and outs of this dynamic machine. The interior of the 2018 Volkswagen SportWagen gives its driver an upscale setting with plenty of available high-class amenities to choose from. 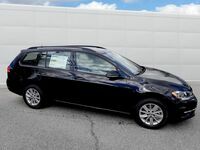 For example, the SE trim comes standard with KESSY® keyless entry with push-button start, meaning you can get access to unlocking and starting your vehicle without ever having to take the key out of your pocket. For even more luxury, the top-of-the-line SEL trim comes standard with Climatronic® automatic dual-zone climate control, a navigation system, ambient lighting, a Fender® Premium Audio System, and more. In terms of safety technology, higher trims of the new Golf SportWagen feature driver assist features, such as Forward Collision Warning and Autonomous Emergency Braking with Pedestrian Monitoring. One of the ways that Volkswagen helps the new SportWagen to stay ahead of its time is by giving it the available Volkswagen Car-Net Suite. This collection of tools is divided into three key areas: “App-Connect,” “Security & Service,” and “Guide & Inform.” The first, Car-Net App-Connect, is found standard across all models and allows you to connect your smartphone to the vehicle's infotainment screen through Apple CarPlay™, Android Auto™, and MirrorLink®. The second, Car-Net Security & Service, allows drivers to access their vehicle remotely to check vehicle diagnostics and monitor security systems. Finally, Car-Net Guide and Inform gives you options for enhanced navigation and a better infotainment experience. If you would like to see the 2018 Volkswagen Golf SportWagen in person, stop by Dirito Brothers Volkswagen for a test drive today!